Simplicity is perfection! This amazing traditional Briam recipe is the brightest example of how Greek cuisine takes the simplest ingredients and with literally no effort transforms them into a finger licking dish! 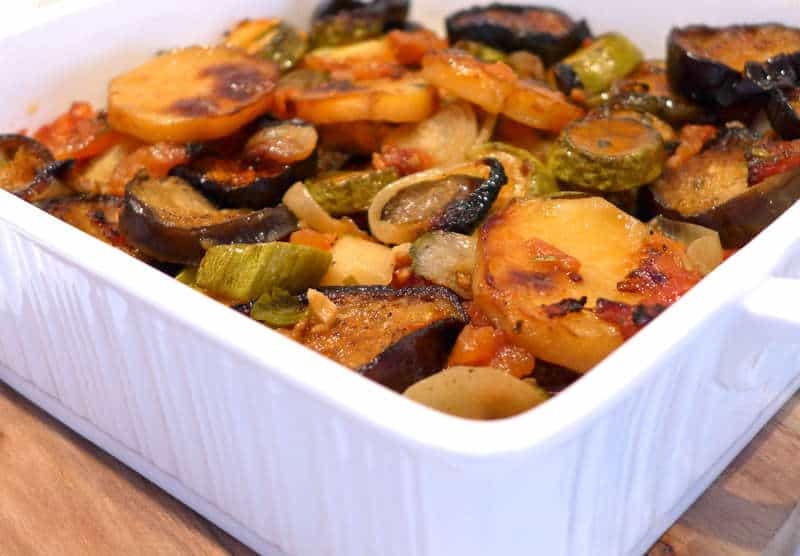 Briam is a traditional Greek recipe for mixed roasted vegetables or let me rephrase.. This Greek Briam recipe is with no doubt the most delicious mixed roasted vegatables you have ever tried! Crispy and fluffy potatoes, sweet, flavourful aubergines and juicy zucchinis garnished with fresh herbs to form an amazing full of Mediterranean flavours hearty vegetarian dish. The vegetables are coated with olive oil, flavoured with sweet onions and garlic and then baked to perfection. Simply delicious! This traditional Greek recipe for Briam falls under the category of Greek dishes called “Ladera”, meaning Greek dishes prepared only with olive oil, with no addition of other fat. So make sure to use some good quality extra virgin olive oil, which will surely lift the flavour! (See also cooking with olive oil: staying healthy and young). Greek mixed roasted vegetables (briam) are perfect on their own, served with a hearty block of feta cheese and lots of bread to dig into all the delicious juices, or accompanying roast lamb, chicken or pork. With only 10 minutes prep time, this briam recipe is definetely the perfect quick and easy mid-week meal! To prepare this delicious briam recipe, start by preparing your vegetables. Peel and cut the potatoes in slices. Wash thoroughly the courgettes and aubergines and slice into 1cm slices. Alternatively you can cut the vegetables in chunks. Peel the tomatoes and cut into thin slices. (You can also use green bell peppers). To bake the briam use a large baking pan, approx. 30*35cm, so that the vegetables are not layered too deep. Layer the bottom of the pan with sliced tomatoes and season. Place on top the sliced vegetables and season well. Sprinkle with the onion and garlic and top with the rest of the tomatoes. Season well, garnish with chopped parsley and drizzle with olive oil. Cover the briam with aluminum foil and bake in preheated oven at 200C (both top and bottom heating elements on) for 1 1/2 to 2 hours. Uncover the briam halfway through cooking time, toss the vegetables and continue baking until nicely coloured. Serve this traditional briam dish with salty feta cheese and lots of bread. Enjoy! I absolutely love this recipe and I am very pleased to have found this site. I have enjoyed Briam many times in Greek Tavernas whilst on holiday being a vegetarian and this comes very close to the originals. My husband, as a meat eater, enjoys this meal as much as me and the whole pan is soon mopped up with crusty bread when the family comes round. A lovely recipe, thanks. It reminds me of the sheer joy my vegetarian daughter showed when she was offered Briam in Lefkas island on holiday in 2010. Veggies have a thin time in Greece generally, and briam was her saviour! Oh yes, being a veggie in Greece is definitely a difficult ask. However, there are quite a few little treats even for vegetarians – briam, gemista, cheese pies, courgette balls, tomatokeftedes to name a few of my favourites 🙂 Give them a try and she’ll thank you! Ah thank you mary! Hope you find many more that you like and do keep an eye out on the homepage for the new christmas treats I’ve prepared for everyone! really great recipe, delicious! thank you! Excellent briam Eli! We usually skip the eggplant, but your version looks amazing! Loved your work! Nice recipe. Can’t help thinking step 3 should be lining with potatoes and not tomatoes. Some recipes recommend salting and pressing the eggplant first to reduce the liquid. Anyone do that? Is it necessary?